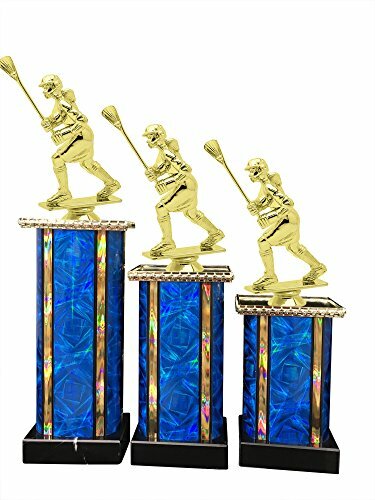 3- Pack of Premium Column Award Trophies that start with a Genuine Marble Base that measures 3" x 2" x 3/4". We then add a 6.5" - 5" and 4" Blue Moonbeam column and detail, and then top the trophies with detailed sport figures. (Most Sport Figure tops measure 6" in height, some figures vary in overall height.) We then finish the each trophy with up to 3 lines of Black Laser Engraved Text on attached Gold Plates.